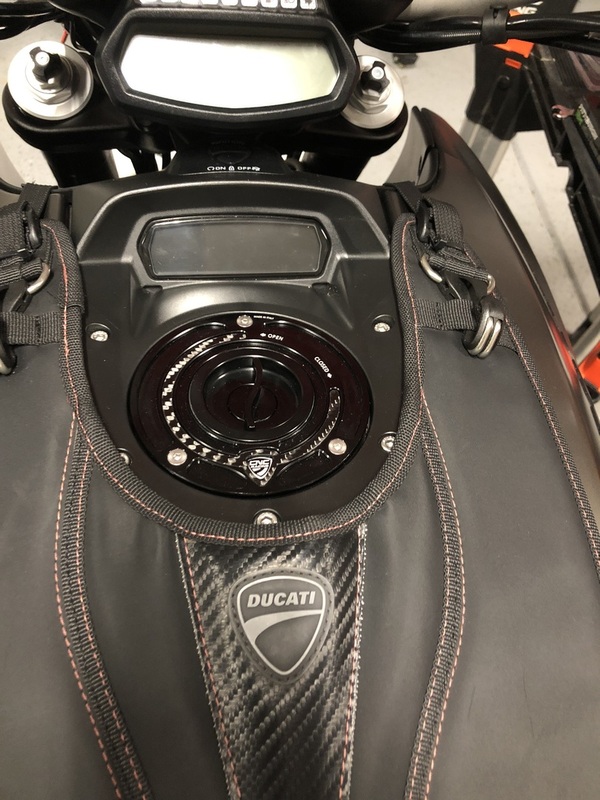 Aprilia / Ducati / MV Agusta Fuel Cap Kits By CNC Racing. These are very high quality and direct replacements. Brilliantly designed and come in a variety of colours with quick release or Lock closing System. These Fuel tank cap systems are CNC machined from light alloy billet and then given a coloured anodized surface finish. Notable for its exclusive, race-style design, its pairing of ergal and carbon results in a unique, top-quality product. It is designed with option of key locking or quick release technology so there is less risk of tampering when on the road. These fuel caps comes with visible machined lines on the surface. Also, there are recessed areas around the bolt mount holes to further reduce weight. The systems on both cap mechanisms are secure and use the latest in electrolytic passivation processed to anodise these caps in multiple combination captivating colours. These also have simple yet effective hint of carbon fiber on the fuel cap that breaks the colour up. IMPROVE YOUR TANK WITH THESE STUNNING FUEL CAPS BY CNC RACING. Part came on time and as aspected. Good packaging and perfect condition. Installation was challenging on my Diavel Strada but looking very good. Thank you for good service and high quality parts.